Can you provide the history of who owned the property at 1701 Gent Avenue and the businesses that occupied it over the years? ~ Jeff C.
For readers who may not be familiar with its location, Gent Avenue is a relatively short street on the near northwest side, extending from Indiana Avenue at its south end to West 22nd Street at its north end, between Fall Creek on the east and White River on the west. Prior to the establishment of building lots in the area, which was late in the nineteenth century, the land was for many years farmed by the Schürman family. 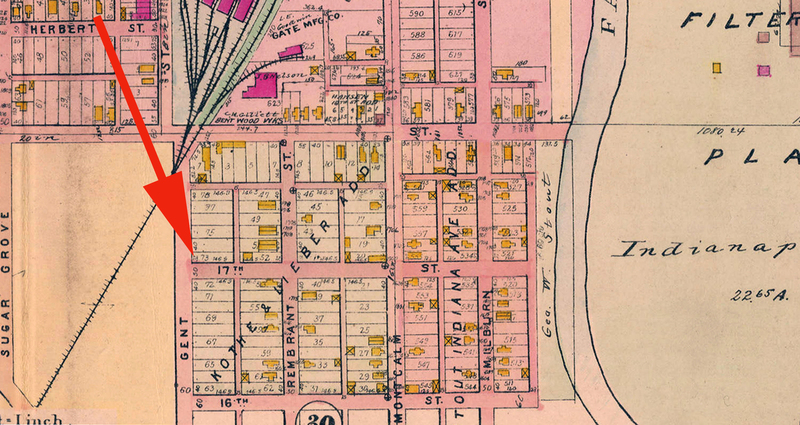 The street that is now North Harding Street was originally called Schurman Avenue. The street that is now Gent Avenue was originally called Post Avenue. 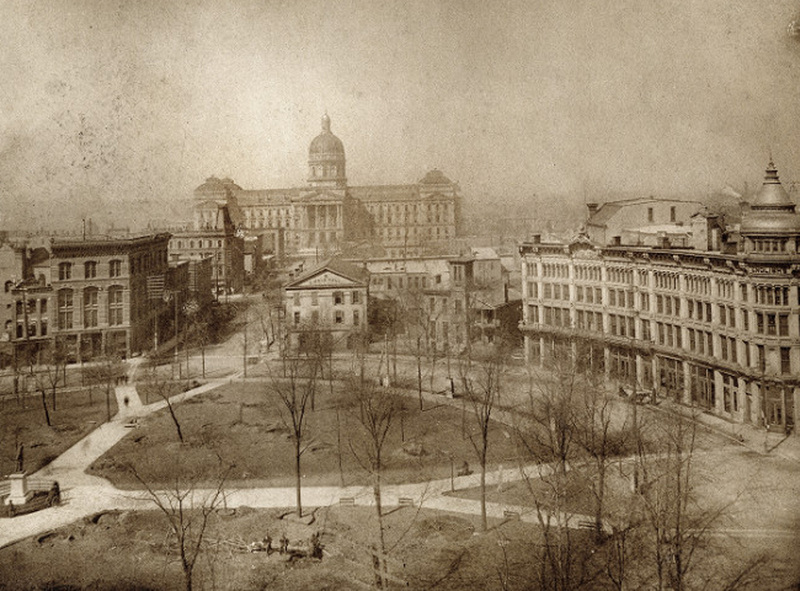 The area was recorded on April 1, 1892, as Kothe & Lieber’s Addition to the City of Indianapolis, but it was a number of years before anything was built on the Gent Avenue lots. 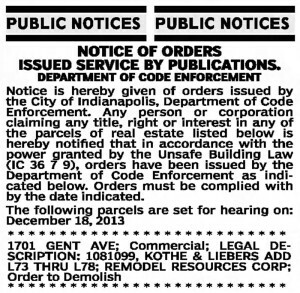 The property that has the street address of 1701 Gent Avenue is Lot 73 in Kothe & Lieber’s Addition. As the history of that address is intertwined with the histories of Lots 74 through 78, all six lots will be included in the discussion here. 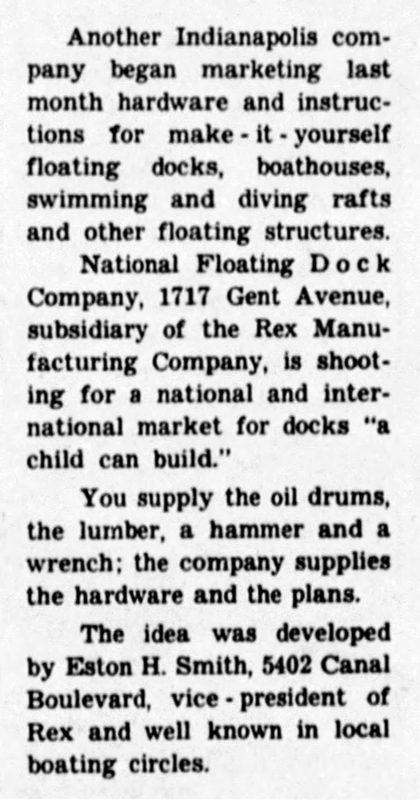 In 1916, Richard J. Ward built a single-family residence on Lot 77, which was assigned the street address of 1717 Gent Avenue. 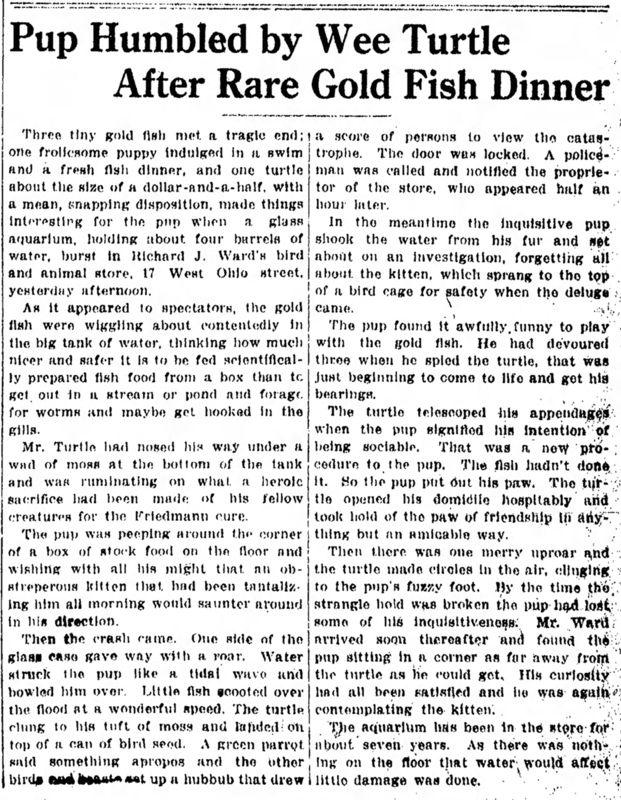 Ward was the proprietor of a bird and animal store at 17 West Ohio Street. 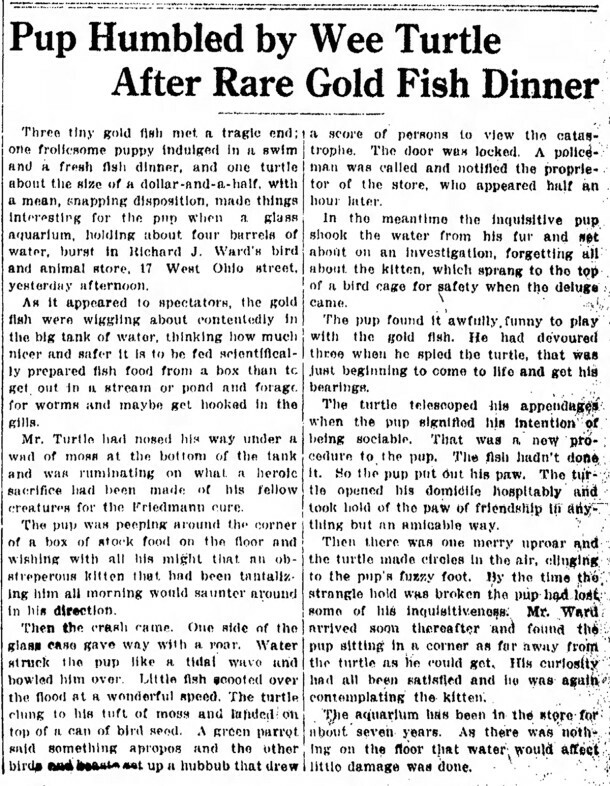 A newspaper article reported on an incident that occurred in Ward’s establishment. 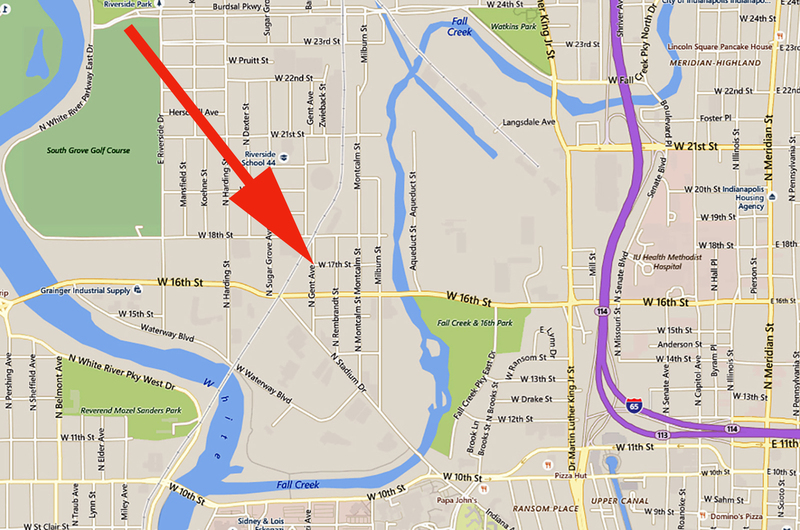 Soon after occupying the residence, Richard Ward built an auto repair garage behind his home at 1717 Gent Avenue. It was accessed by an alley between Gent Avenue and Rembrandt Street, which is the next street immediately east of Gent. 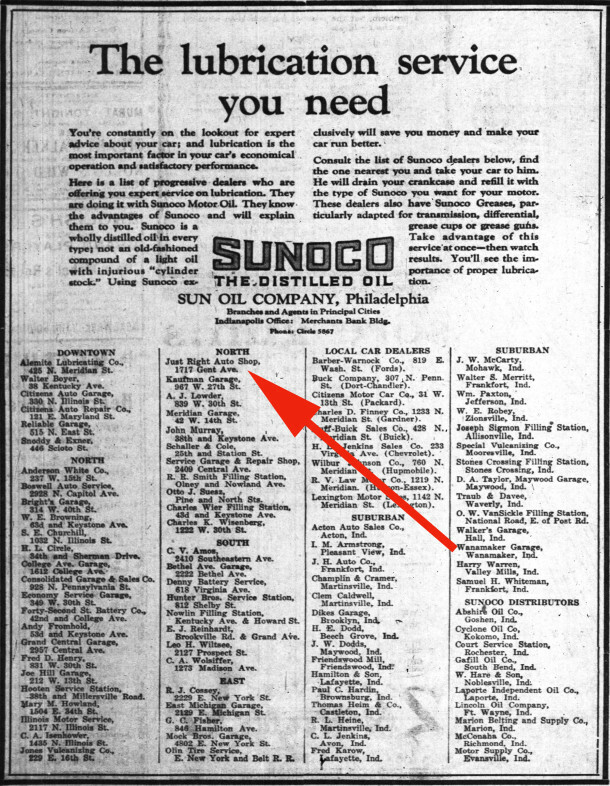 The Just Right Auto Shop appeared in a 1923 newspaper ad. 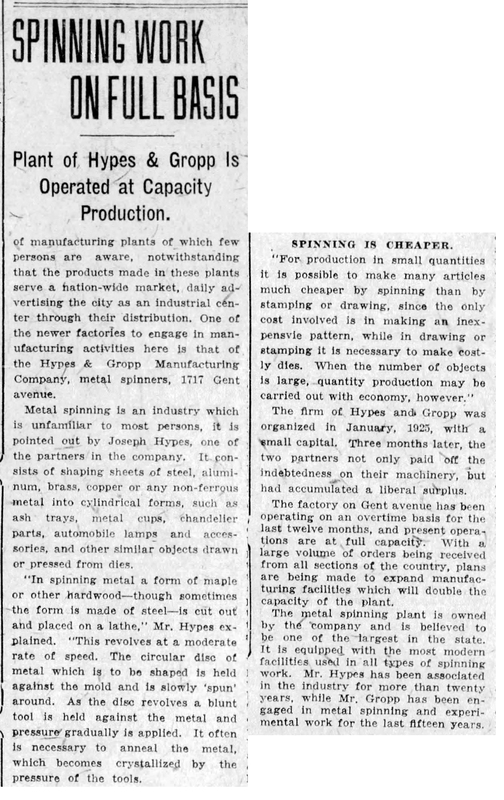 In 1925, the recently organized company of Hypes & Gropp Metal Spinners purchased 1717 Gent Avenue and began to manufacture products in the building at the back of the residence’s lot. 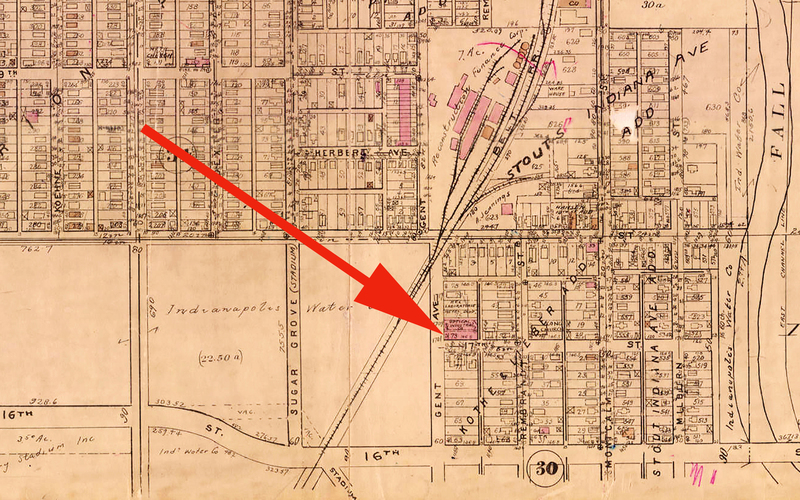 By 1929, structures had been built on five of the six lots in the 1700 block of Gent Avenue. The businesses in these buildings included Hypes & Gropp Metal Spinners, Rex Laboratories Metal Shop, and Optical Industries. 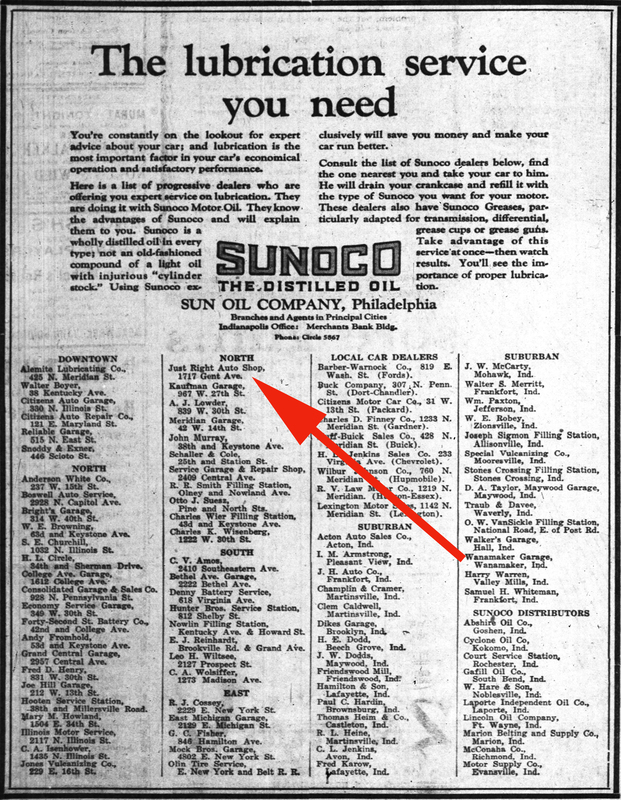 The latter two companies were owned by Benjamin Dickens Aufderheide (1878-1957). 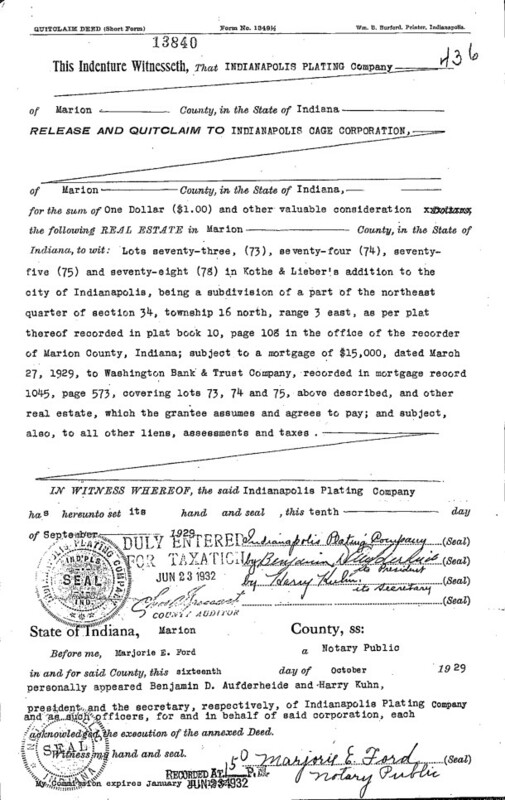 Lots 73, 74, 75 and 78 were owned by the Indianapolis Plating Company, which was also owned by Aufderheide. 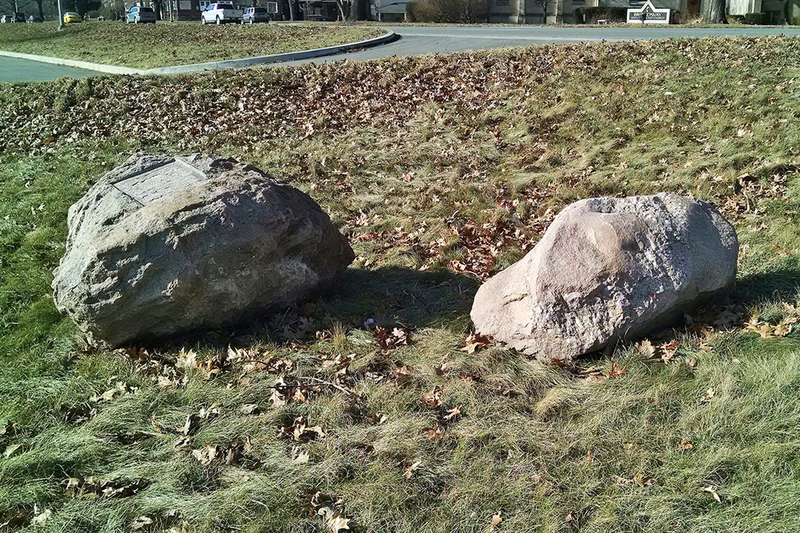 Lots 76 and 77 were owned by John and Florence G. Cook, husband and wife. In 1929, the Indianapolis Plating Company quitclaim deeded Lots 73, 74, 75, and 78 to the Indianapolis Cage Corporation. The primary product of the latter was bird cages. 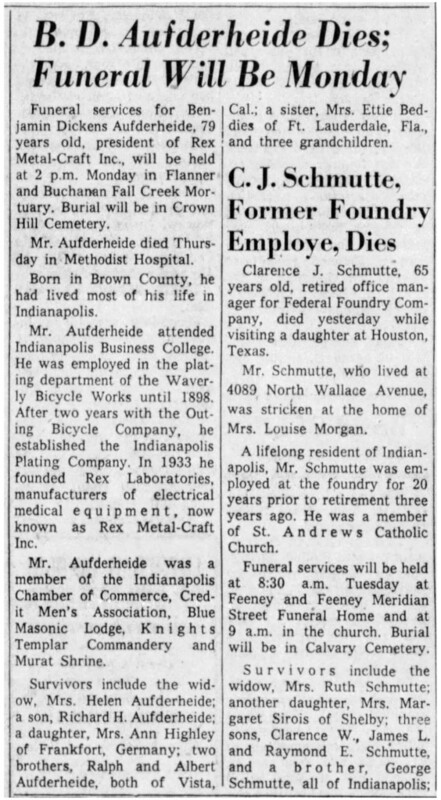 Aufderheide was the owner of Indianapolis Cage Corporation, so the ownership was merely transferred from one of his companies to another. 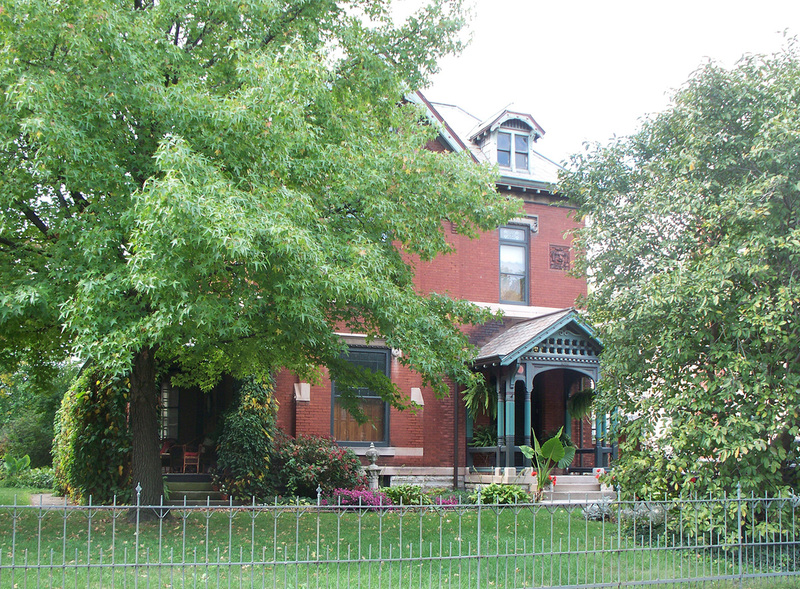 In 1933, Benjamin D. Aufderheide and his wife Helen personally purchased Lots 76 and 77 from John and Florence G. Cook, which meant that the Aufderheides then owned the entire 1700 block of Gent Avenue. One of the products manufactured in the building at the rear of 1717 Gent Avenue was an ultraviolet ray lamp that was for treating respiratory and skin diseases. In the late 1920s, the head of Chicago’s International Brotherhood of Electrical Workers, Michael Joseph Boyle (1879-1958), became interested in auto racing. 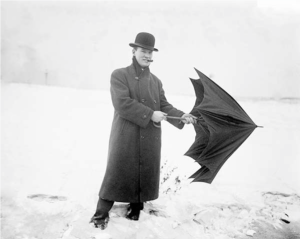 Nicknamed “Umbrella Mike,” because he often carried one, the powerful union leader was a tireless advocate for IBEW members. 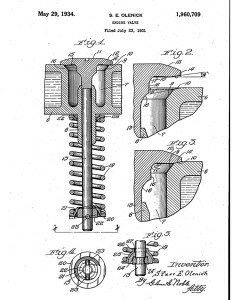 In the mid-1920s, the union boss began the manufacture of an engine valve under the name of the Boyle Valve Company. 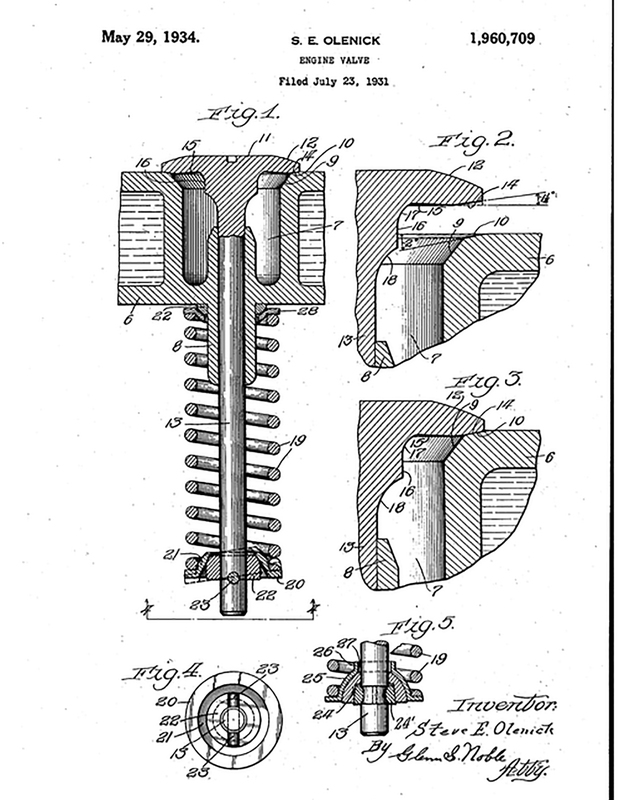 Although Boyle himself did not invent the valve, he received U S Patent #1960709 for it. The first Boyle Valve Special to enter the Indianapolis 500 was in 1926. The first Boyle Valve Special to win the race was in 1934, when Bill Cummings piloted a Miller vehicle to victory. It’s not clear exactly when, but sometime in the early 1930s, 1701 Gent Avenue became the home of the Boyle Racing Team. Interestingly, there was never a listing for any of Boyle’s enterprises in the Indianapolis City Directories of the time period, nor did Boyle’s name ever appear on any public record as being an owner or a tenant of the property. 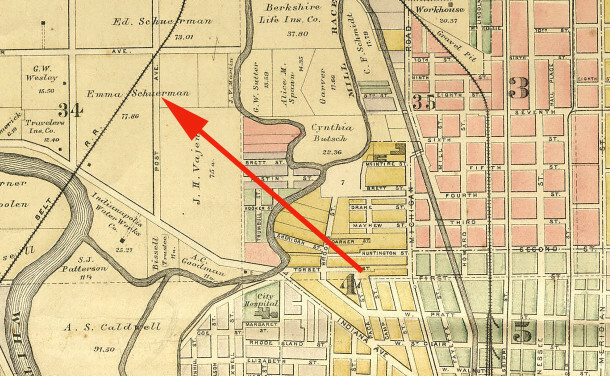 Nonetheless, for more than a decade, 1701 Gent Avenue was well-known as the location of Boyle Racing Headquarters. 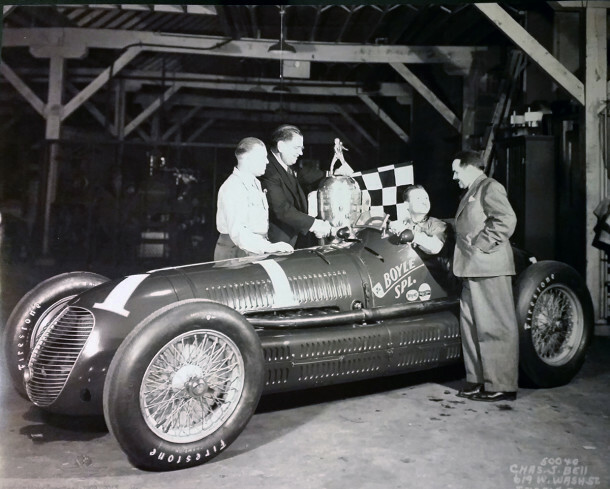 Boyle’s most famous driver was Wilbur Shaw Sr. (1902-1954), who drove Boyle’s Maserati to victory in 1939 and 1940. 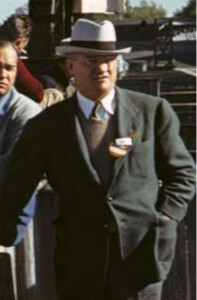 Wilbur Shaw is also considered the savior of the Indianapolis Motor Speedway. The annual race had been cancelled after the 1941 race, due to the United States’ entry into World War II. When IMS owner Eddie Rickenbacker then announced his plan to develop the property into a housing subdivision, Shaw went on a crusade to find a buyer who would keep the site as a race track. He found that person in Terre Haute businessman Anton Hulman. 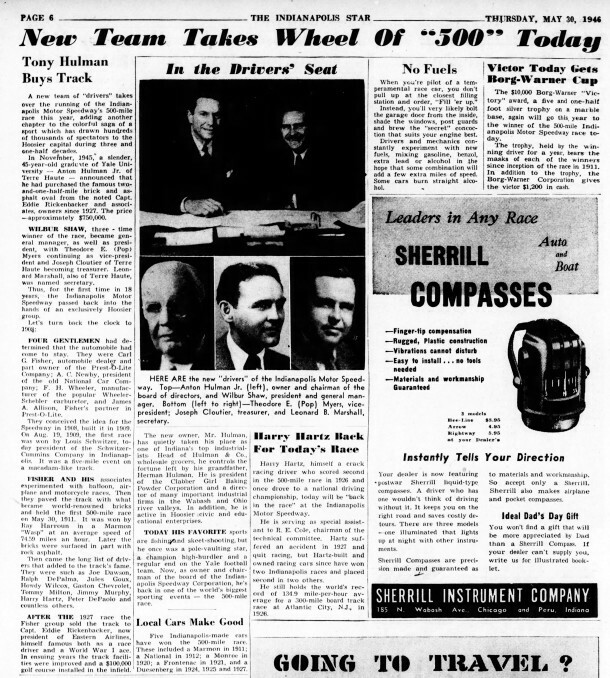 Hulman purchased the Speedway in November of 1945 and made SWilbur Shaw president and general manager. Shaw remained in that role until his untimely death in a plane crash in 1954. 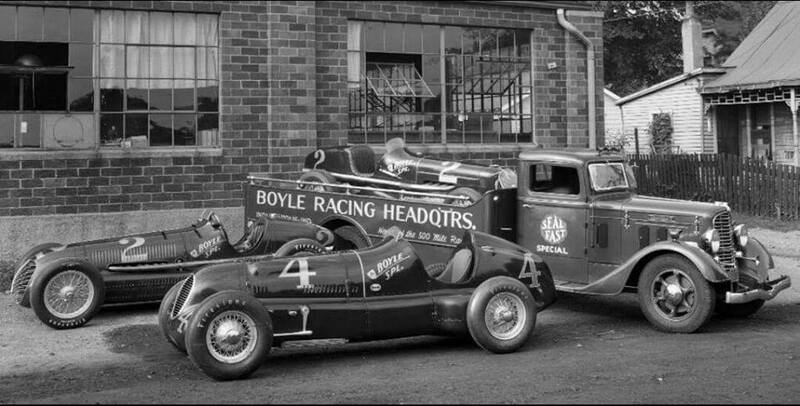 Boyle drivers raced again in 1941 and 1946, but did not win. 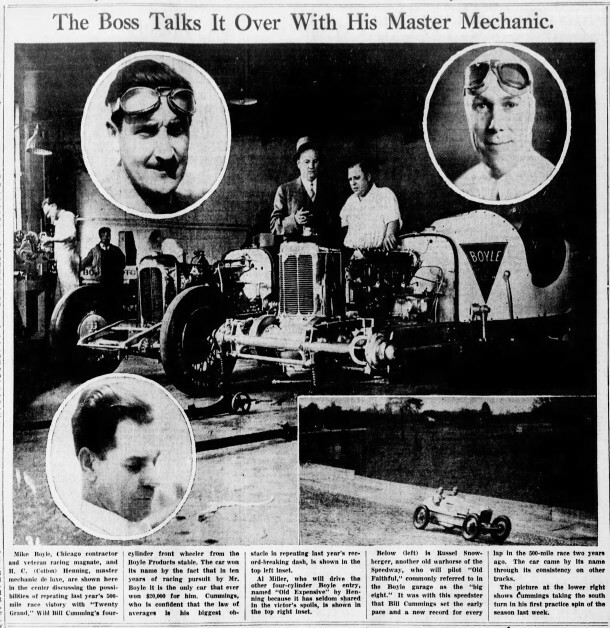 Mike Boyle then turned the management of Boyle Racing Headquarters over to his trusted master mechanic, Harry “Cotton” Henning. Sadly, Cotton died in 1948. 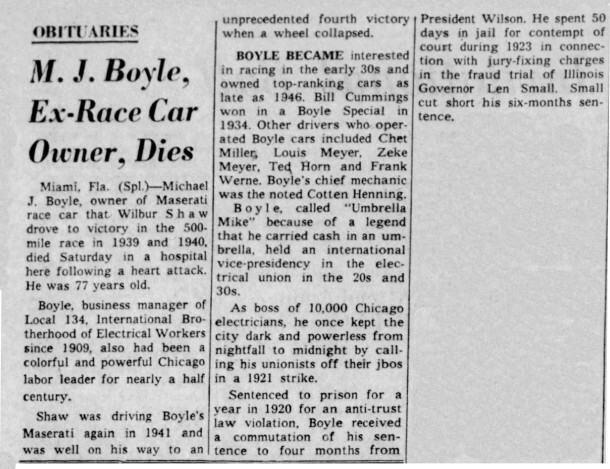 That same year, Boyle also lost a couple of other good friends to racing accidents. He was well into his Sixties by then and tiring of the effort required to stay in the game, so he gave it up. 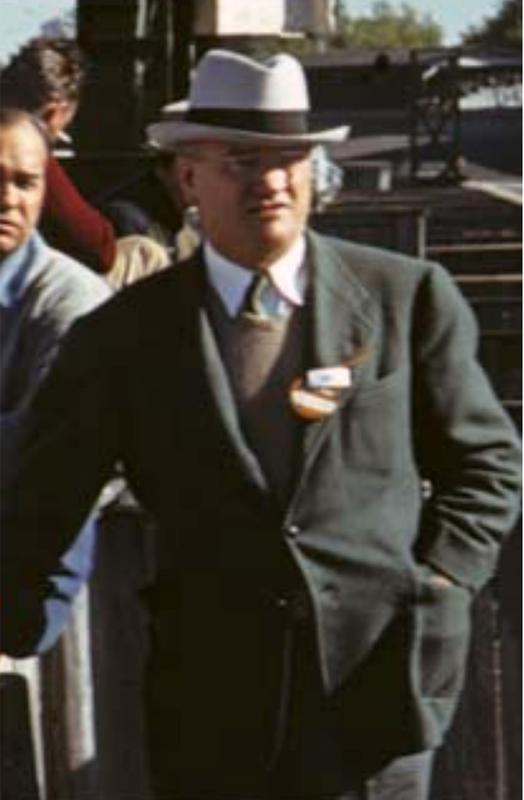 Benjamin Aufderheide, head of the companies that owned 1701 Gent Avenue during the years that Boyle Racing Headquarters was located there, passed away in 1957. Mike Boyle died in 1958, just five months after Benjamin Aufderheide. 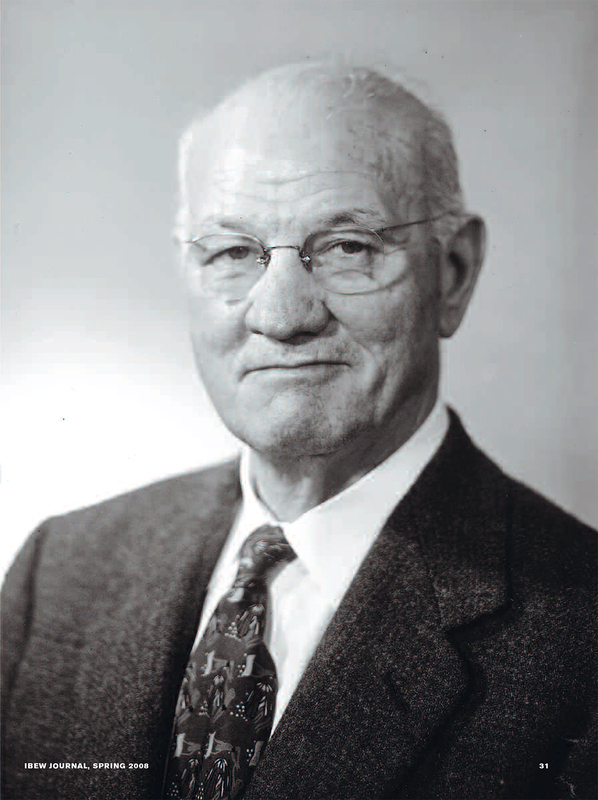 Benjamin Aufderheide’s son, Richard H. Aufderheide (1905-1994), then assumed leadership of his father’s companies. Richard Aufderheide retired in 1982. He was succeeded by his son, Don R. Aufderheide (1927-2011). 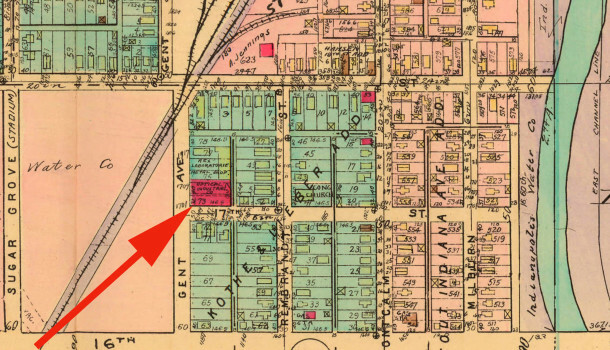 Don sold the lots in the 1700 block of Gent Avenue to Sherman Carburetors in 1984, thus ending more than half-a-century of the Aufderheide family’s ownership of some or all of the property in the 1700 block of Gent Avenue. Pacer Industries took title in 1986. Haldex Midland Brake Corporation became the owner of record in 1998. Z Properties LLC owned the six lots from August of 2006 to October of 2007, at which time Remodel Resources Corporation received a special warranty deed to the properties. The building was neglected and fell into serious disrepair. 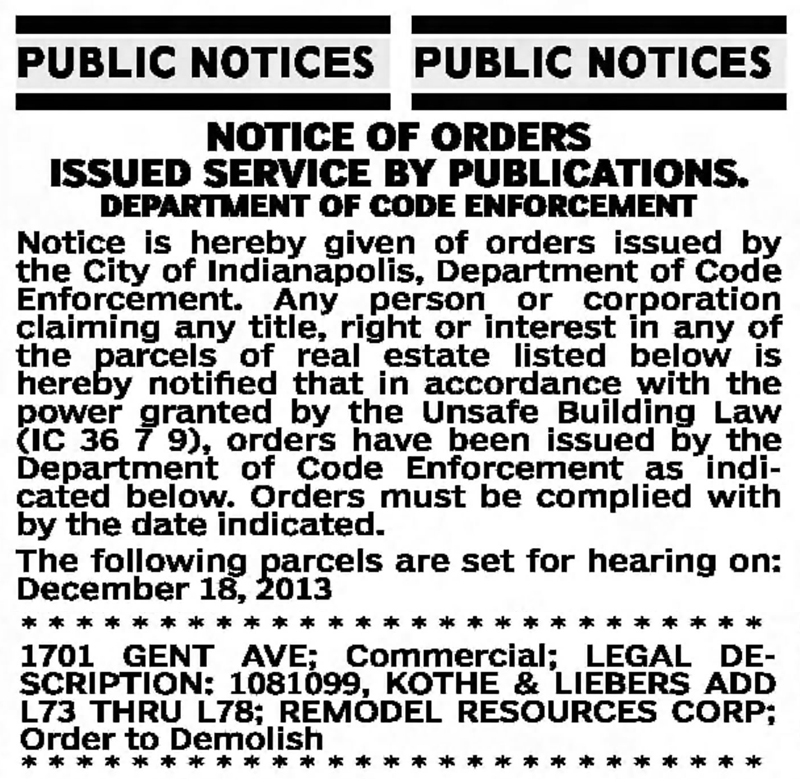 The county seized the property for unpaid back taxes, and the building was scheduled for demolition in 2013. A group of preservation-minded auto enthusiasts became determined to save this piece of Indianapolis’ history. With the help of Indiana Landmarks, they were able to persuade the city to give them two years to renovate the former site of Boyle Racing Headquarters. The property is now owned by Boyle Racing Headquarters Foundation Corporation LLC. 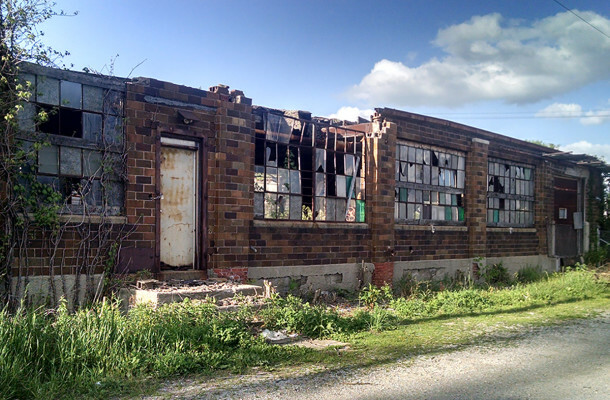 The nonprofit group is seeking funds to restore the building. Events are planned during the month of May, when many racing enthusiasts will be around for the milestone 100th running of the Indianapolis 500. 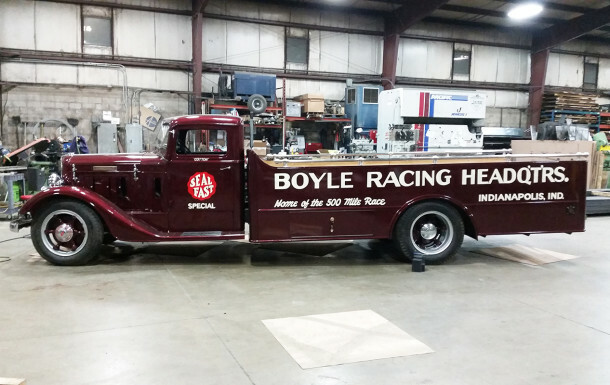 While working on raising the capital to repair the building at 1701 Gent Avenue, the group also managed to locate the 1934 Diamond T 211FF “race car hauler” that transported Boyle’s cars to the track. The vehicle was custom built for Mike Boyle by Gudelhoffer Wagon Works, which was then located at 212 Kentucky Avenue. Missing since the early 1950s, the truck was located by Foundation members John Pappas, Jeffrey Congdon, and Wilbur “Bill” Shaw Jr. They unearthed it and rebuilt it with original and replicated parts. If you wish to contact members of the Boyle Racing Headquarters Foundation, click here. To visit the group’s Facebook page, click here. Readers who have memories of Boyle Racing Headquarters are encouraged to leave comments below this article. PreviousDeja Vu Tuesday: Would a Hoosier by any other name smell as sweet? Born in 1937, I vaguely remember the racing business at that location. 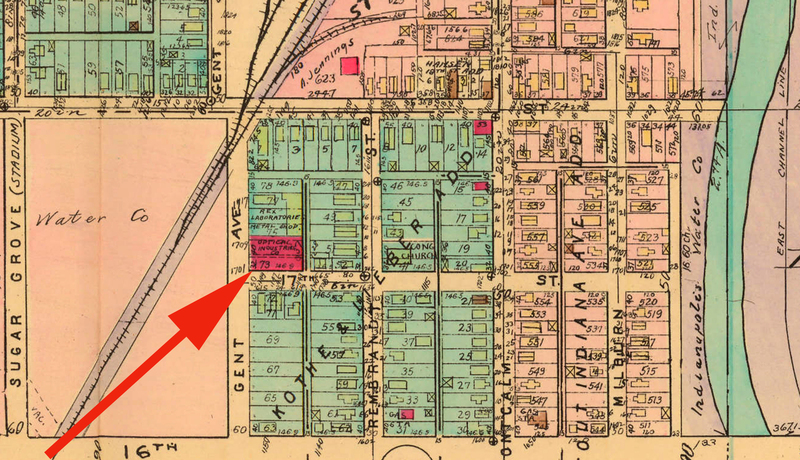 I lived at 1224 West 18th Street, one-half block west of Gent till age 11. My grandmother owned the huge double house at the southeast corner of 15th and Gent, so walking to her home, I frequently passed that location. 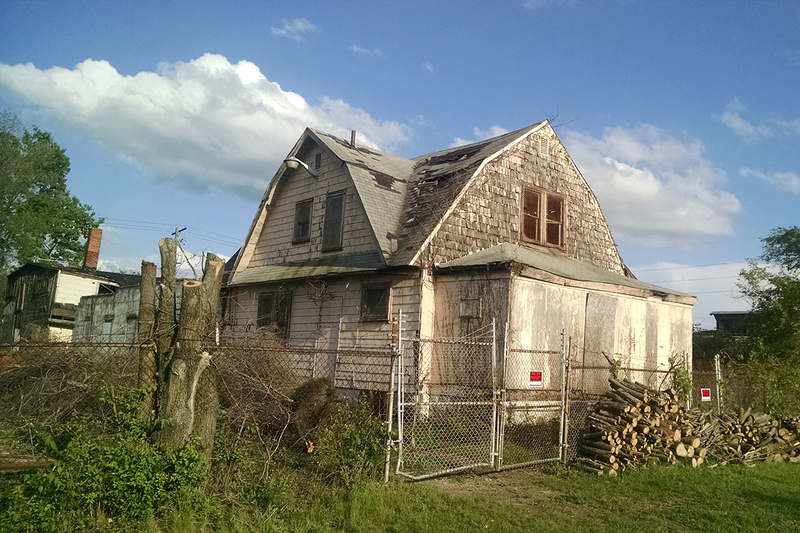 There was one falling apart shed across 15th Street where “bums” would often sleep; one was found dead inside once. An occupied house was next door; possibly the McManns lived there. Daugherty’s Old Homestead Tavern sat on the southeast corner of 18th and Gent; a popular neighborhood watering hole. It was across 18th Street from Glidden Feed Mills/Central Soya with the huge grain silos. 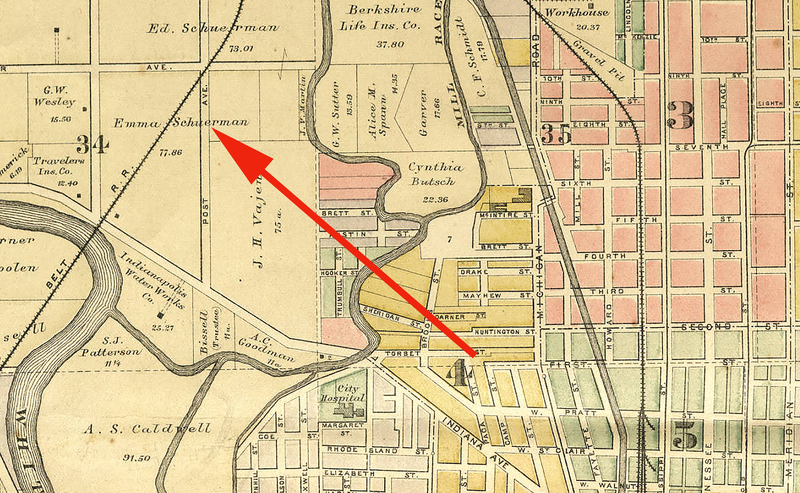 At age 11, my family moved to 2019 Gent, I lived 2 houses north after married and with my first child, so I remember the area but have forgotten what was located in the 1700 block of Gent. Thanks for this history; very interesting. Drove through that area about 5 years ago; disheartening and frightening condition at that time. Did turning Victory Field into Stadium Lofts help renovation of that area? Thank you for posting a comment here. It was interesting to read your reminiscences of the neighborhood surrounding 1701 Gent Avenue. I am sorry that I am unable to answer your question about whether or not Stadium Lofts has helped in the renovation of the area, but perhaps other readers of this article will have some knowledge of that subject. I do have a question for you, though. Is Gent pronounced with a soft “G” or a hard “G”? I could not find anyone who could tell me (absolutely, positively) the pronunciation. 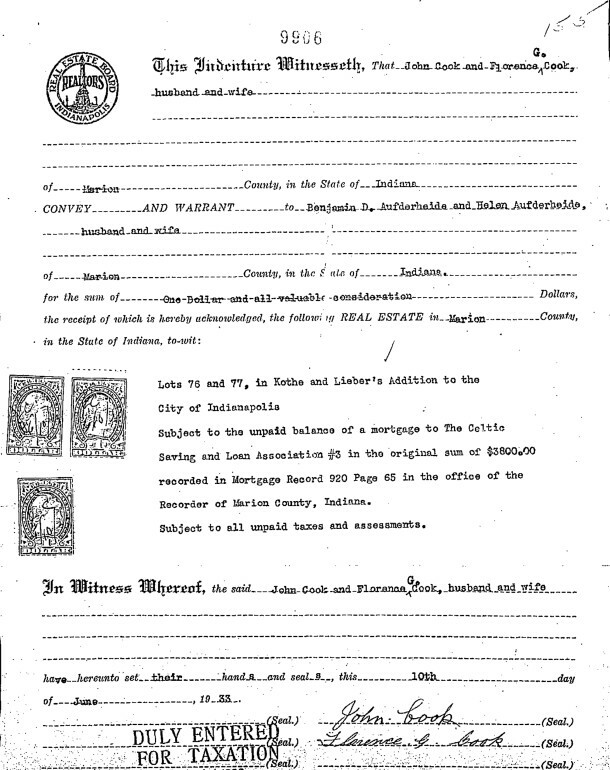 Using city tax records as my guide to the names of the present owners, I looked up the phone numbers of about a dozen people who currently are in title to homes on Gent Avenue. When I tried to call the phone numbers I found listed for them on the Internet, I got an automated recording that the number was no longer in service for every single phone number I tried! Noticed you never got a reply to your question. The pronunciation is soft “G” – as in “Gentleman”. We lived at 2168 Gent Avenue until 1958 (only housing my parents could find after WWII). 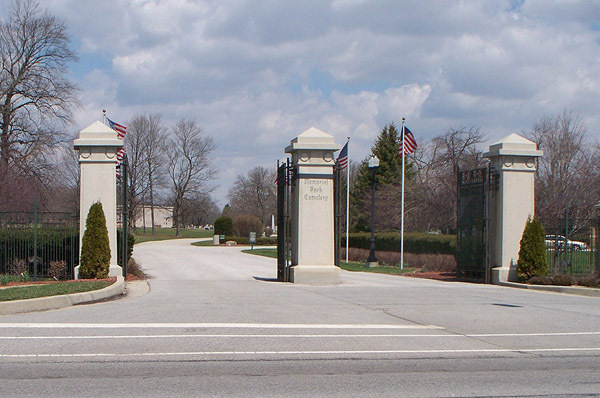 Indiana Landmarks is hosting a bicycle tour of 500 personality-related graves at Crown Hill on Sunday May 15 (sorry, it’s already sold out) that will include a stop at Cotton Henning’s grave, where I believe a representative of the effort to restore the Boyle Facility will be present. Great! Thanks for letting us know.